The Museo di Storia Naturale di Venezia is one of the most famous natural history museums in Europe. In such an exhibition you finds from nature are collected and conserved. These are, for example, former plants and animals. Several million species of still existing and extinct life forms are known worldwide. The most famous object in the museum in Venice is a huge skeleton of a dinosaur from Africa (Sahara). The Natural History Museum of Venice is housed in a remarkable palace directly at the Canal Grande in Venice. On the ground floor visitors will find, among other things, a historical library and an aquarium with living animals. Above all on the upper floor are the actual exhibition rooms of the Venice Natural History Museum. It is dedicated to topics such as the development and evolution of life on earth, wonders of life and strategies of plants and animals. The museum goes back to Teodoro Correr, who lived in Venice between 1750 and 1830. He mainly collected books and other writings. Since 1923, the Natural History Museum has been housed in the beautiful Fontego dei Turchi Palace in central Venice. The house with the inner courtyard of the Natural History Museum Venice is also worth seeing. The collection of historical objects by Correr is now in the Museum Correr at St. Mark's Square. The collection of natural objects remained in the Fontego dei Turchi Palace, which now houses the Natural History Museum. In the course of time the museum has been significantly extended and modernised. Today it is a modern natural history museum with lots of technology and light effects. The thousands of stuffed animals preserved by other methods are especially worth seeing. Almost everything is there, whether mammals, birds or smaller invertebrates. The collection of hymenoptera, an order of insects, is said to be one of the largest in the world. Unfortunately almost all signs in the Museo di Storia Naturale are only in Italian. At the exit, as in many museums in Venice, there is a bookstore. Here you can find literature about animals, plants, evolution and so on. There are also many books for children. We found the aquarium, which one reaches shortly before the exit in the ground floor, rather disappointing. It is only a tank with fewer fish species. But this is also not the main topic of a nature-faced museum. The palace Fontego dei Turchi with the Natural History Museum is located directly on the famous Canal Grande waterway. It is centrally located on the island of Venice (Centro storico). The Natural History Museum can be reached on foot in about 20 minutes from Santa Lucia railway station. Those who are not so good on foot or have a time ticket for the public transport Vaporetti (water buses) can also take the boat line 1 to the bus stop San Stae on the Canal Grande. Attention: Only line 1 stops here, line 2 passes this stop. From the other direction you can get on the island of Lido near Venice and near St. Mark's Square (San Marco stop). From the passenger ferry landing place it is about 150 metres on foot to the Museo di Storia Naturale. Palazzo Fontego dei Turchi is on the south bank of the Canal Grande. This is important because there is no bridge nearby. The museum is directly south of the Canal Grande. Admission to the Venice Natural History Museum costs 8 euros for adults. Pupils, students and persons over 65 pay 5,50 Euro. Children under 5 years are free, there is a reduced ticket for families. All prices from January 2019. 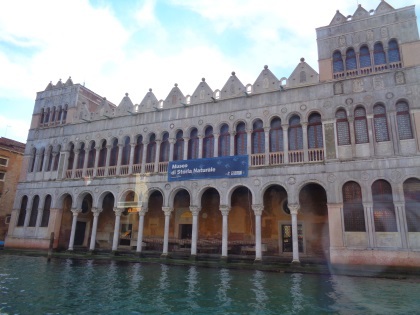 The museum can also be visited with the Venice Museum Pass. The tickets for the "Natural History Museum", as the exhibition is called in international tourism, can be bought locally. The queues are not too long. For the big sights of Venice, like the Doge's Palace, the Markusturm or the Peggy Guggenheim exhibition for modern art, we recommend to buy the tickets in advance on the internet to avoid long queues. We recommend the Getyourguide.com website for this purpose. The Museo di Storia Naturale di Venezia is open in summer every day except Monday from 10 am to 6 pm. During the rest of the year the opening hours during the week (Tue to Fri) are brought forward to 9 am to 5 pm. On weekends (Saturday, Sunday, public holidays), the opening hours are from 10 a.m. to 6 p.m. even in winter. On Mondays the natur museum is closed all year round. Otherwise the Natural History Museum in Venice in 2018 is as far as we know closed only on Christmas Day and New Year's Day. Data status summer 2017.